Employment at Stop & Shop, you'll find the recipe for success. 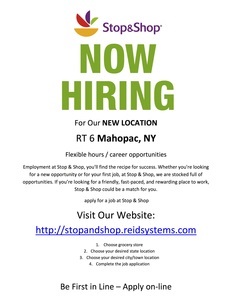 Whether you're looking for a new opportunity or for your first job, at Stop & Shop, we are stocked full of opportunities. If you’re looking for a friendly, fast-paced, and rewarding place to work, Stop & Shop could be a match for you. Be First in Line – Apply on-line!